In celebration of this year’s upcoming Mother’s Day, SuccessStory will be featuring posts throughout this week related to celebrating the power of successful working mothers everywhere. Today, we are returning to the profile of a highly accomplished and award-winning international actress whose incredible work has attracted significant critical attention from both the media and audiences. Get to know more about Cate Blanchett and watch this space for more of our Mother’s Day 2017 coverage. There was once a time when all Australia had to offer were kangaroos and vast swathes of uninhabited wild landscapes and very little else when it comes to the arts and entertainment. This is now considered a thing of the past as the mythical Land From Down Under is now one of the premier destinations for discovering new entertainment stars that could rival the best talents emerging from North America, Europe, and Asia. From chart-topping musicians to award-winning thespians, Australia is now a viable birthplace for many talented individuals looking to make it big in the entertainment industry. Though this island nation may be thousands of miles away from the gates of Hollywood or the threshold of the European film industry, it certainly hasn’t stopped countless talents from making a major name for themselves on a global scale. And of the many Australian luminaries leading the charge, there is perhaps no greater name that comes to mind than Cate Blanchett. This incredibly accomplished actress is regarded as one of Australia’s national treasures and as an internationally renowned movie star whose name graces theater marquees all over the world. With her patrician features, luminous skin, flaxen hair, and statuesque physique, Blanchett certainly cuts a striking figure whenever she graces her presence at high-profile red carpet events. More than just a woman with a seemingly immortal beauty, she posseses a truly impressive acting range that allows her to embody a wide variety of complex and interesting characters. Her formal training in dramatic arts has allowed Blanchett to be familiar with the rigors of acting, and it definitely shows through her impressive body of work which she has done over the years, ranging from theater to film projects. Furthermore, her astonishing performance capabilities have given Blanchett to work with some of the best actors, directors, and other creative collaborators which helped solidify her status as an in-demand actress with a high degree of poise and professionalism. Blanchett’s career is certainly one that one aspires to have should he or she would love to pursue acting as a profession. Indeed, her prolific presence on film and on the stage would put her contemporaries to shame. Hardworking, passionate, and determined, Blanchett has used her undeniable star power to bring attention to some of the causes she deeply supports. She is a fierce advocate of the arts, champions a variety of humanitarian efforts, and has shared her views on feminism and the importance of giving women everywhere equal rights. There can be no doubt whatsoever that Blanchett is a positive role model for girls and young women everywhere who dream of achieving the same lofty heights she has managed to earn in her life. But above all, it is Blanchett’s unparalleled skills as an actress that has made her an indispensable asset in the world of entertainment, and whose work not only inspires audiences but also that of her peers within the industry. Born as Catherine Elise Blanchett on May 14, 1969 in Melbourne, she is a daughter of an Australian mother, June Blanchett (née Gamble), and an American father, Robert DeWitt Blanchett, Jr. Her father originally hailed from Texas and was formerly a United States Navy petty officer before working as an advertising executive; her mother, meanwhile, worked as a teacher as well as being a property developer. Blanchett’s father died of a heart attack when she was ten years old, and her mother decided to raise her family on her own. She is the second of three children where her older brother currently works as a computer systems engineer and her younger sister holds a position as a theater designer. Blanchett’s nascent passion for acting started in her youth when she exhibited a penchant for masculine dressing, and even went through aesthetic phases during her teenage years such as exploring punk and goth subcultures as well as shaving her head at one point. She attended Ivanhoe East Primary School during her elementary years, Ivanhoe Girls’ Grammar School in her secondary education, and then to Methodist Ladies’ College where she would ultimately discover her passion for the performing arts. Blanchett had a brief stint studying at the University of Melbourne where she took up economics and fine arts before dropping out after a year to travel abroad. Blanchett ended up in Egypt where her very first filmmaking experience was as a foreign extra in an Egyptian film production. She later returned to Australia and continued her education at the National Institute of Dramatic Art (NIDA) in Sydney, where she decided to pursue a serious career in acting and graduated from NIDA in 1992. After graduating from NIDA, Blanchett’s first professional acting jobs were rooted in Australian theater productions—something which the actress continuously credits in improving her skills as a performer and a part of the industry where she remains not only as a staunch supporter but also as an active presence. Her very first major stage role was in a play for the Sydney Theater Company where Blanchett co-starred with actor Geoffrey Rush. More prominent stage roles would soon follow for Blanchett, including the role of Ophelia in William Shakespeare’s Hamlet. Effusive praise from professional theater critics and strong word of mouth from her peers in the business soon led Blanchett to land roles on television, such as the 1995 miniseries Bordertown starring alongside actor Hugo Weaving. Blanchett’s official feature film debut as an actress with a speaking part was a supporting role in Paradise Road (1997), where she played an Australian nurse captured by Japanese armed forces during World War II. She soon followed it up with a lead actress role in the romantic drama film Oscar and Lucinda (1997), where she acted opposite Ralph Fiennes. At this point in her career, Blanchett was already receiving massive praise in the Australian entertainment industry and it wasn’t long before she made the leap from her homeland and into the global spotlight like so many talented Australian thespians before her. Blanchett’s significant turning point was when she snagged the plum leading role of Queen Elizabeth I in the historical drama Elizabeth in 1998, with a supporting ensemble cast that included Geoffrey Rush, Joseph Fiennes, and the late Sir Richard Attenborough. The role proved to be a huge hit with critics and audiences and catapulted her into Hollywood stardom, as well as gaining Blanchett her first major nominations in various international film festivals and award-giving bodies such as the Screen Actors Guild (SAG), the British Academy of Film and Television Arts (BAFTA), and the Academy of Motion Picture Arts and Sciences (AMPAS). Her subsequent film apperances after that fortuitous milestone was in Pushing Tin (1999) with Angelina Jolie and Billy Bob Thornton and in The Talented Mr. Ripley (1999), co-starring Matt Damon, Jude Law, Gwyneth Paltrow, and the late Philip Seymour Hoffman. With her status as a bonafide Hollywood actress cemented, Blanchett was cast in director Peter Jackson’s monumental blockbuster epic film trilogy for author J.R.R. Tolkien’s book series, The Lord of the Rings. Throughout this multi-billion dollar franchise, she portrayed the role of Galadriel, a powerful Elven queen who allies herself with the forces fighting against the villainous Sauron. Blanchett would later ascend to greater heights when she won her first competitive Academy Award for acting in her supporting role in director Martin Scorsese’s The Aviator (2004) starring Leonardo DiCaprio. Blanchett further proved her mettle as a serious actress with more heavyweight projects that were destined for Oscar attention such as Alejandro González Iñárritu’s film Babel (2006) with Brad Pitt and Notes on a Scandal (2006) with Dame Judi Dench. Blanchett starred in several more stage plays produced by the Sydney Theater Company before returning once more in front of the camera for big-time screen projects, both in blockbusters and serious dramatic fare. She would reprise her role as Galadriel in the prequel trilogy to The Lord of the Rings entitled The Hobbit (2012-14) and would gain her second Academy Award—this time as a lead actress—for her role in director Woody Allen’s film, Blue Jasmine (2013), which was a loose and modern take on A Streetcar Named Desire and where Blanchett portrayed an updated (yet no less impressive) version of Blanche DuBois in the form of fallen Manhattan socialite named Jeanette “Jasmine” Francis. She would go on to achieve another Oscar-nominated performance for her role in the lesbian romantic period drama film Carol (2015) where she co-starred with actress Rooney Mara. Blanchett is married to Australian screenwriter and playwright, Andrew Upton, whom she met in 1996 at the set of a television show and ended up marrying on December 29, 1997. The couple have four children together: biological sons Dashiell John (born December 2001), Roman Robert (born April 2004), and Ignatius Martin (born April 2008), and adopted daughter Edith Vivian Patricia, whose adoption was confirmed by the couple on March 2015. Blanchett and her family currently reside in Australia, where she has expressed her desires to not only have a permanent home for her children, but to have a sense of proximity and belonging to the Australian theater community, to which Blanchett remains as an active participant on and off stage. 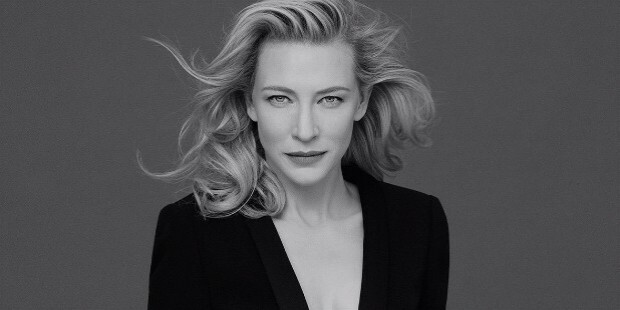 Indeed, her dedication and commitment to the Australian arts has led Blanchett to become a CEO and artistic director for the Sydney Theater Company from 2008 to 2013—a position that she shared alongside her husband. Furthermore, Blanchett is a patron of the Australian Film Institute, the Australian Academy of Cinema and Television Arts, and the Sydney Film Festival. Blanchett is also active in several philanthropic and charitable causes around the world, particularly her appointment as a global goodwiil ambassador for UNHCR, the refugee agency for the United Nations. Blanchett remains the first and only actor thus far in film history to have won an Academy Award for portraying another Academy Award-winning actor, which was achieved in The Aviator when she played the role of timeless screen legend, Katharine Hepburn. Blanchett is only one of six performers—and the only actress thus far—to receive Academy Award nominations for playing the same role in two different films, which was her portrayal of Queen Elizabeth I in 1998’s Elizabeth and its 2007 sequel, Elizabeth: The Golden Age. Blanchett is also one of eleven performers who achieved the astonishing feat of receiving two Academy Award nominations for acting in the same year, which was achieved at the 80th Academy Awards and she was nominated for Best Actress in a Leading Role for Elizabeth: The Golden Age and Best Actress in a Supporting Role for I’m Not There (2007), where she played the role of legendary musician, Bob Dylan.